Marquez Iron Works offers Orange County residential and commercial property owners a wide selection of stylish and exceptional quality pool enclosure fencing at highly competitive prices. Our attractive but secure iron, combination iron and wood, and combination iron and masonry pool enclosures are the perfect choice for providing both safety and security of pool access, as well as for providing a beautiful hardscape feature which will accentuate the look and design of your pool and its surroundings. 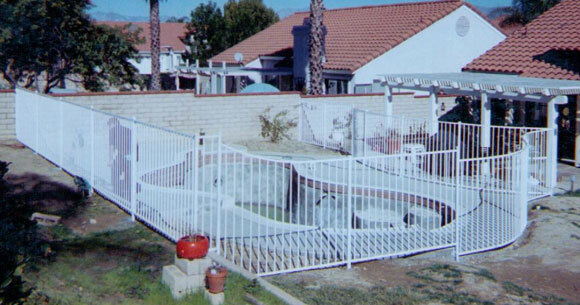 At Marquez Iron Works, our commitment to providing excellence of design, craftsmanship, and long-lasting quality makes us the best value throughout our Orange County service area for affordably priced pool fencing and gates. Since 2001, the ironwork specialists at Marquez Iron Works have worked closely with homeowners, business owners, building contractors, and homeowner associations to design and install the ideal pool fencing solutions to enclose their swimming pools. Whether for a private pool within a residential backyard, or a large swimming pool at a hotel or in a residential community, our professional installers will deliver a highly secure pool and gate which conforms strictly to all applicable municipal building and safety codes, providing the maximum security possible for your family, patrons, residents, and guests. At Marquez Iron Works, we stand behind our pool enclosures with a two year warranty on workmanship, and a three year warranty on materials. Call us today, to learn more about our extensive selection of superior quality pool fencing system designs — offered at unbeatable prices. We offer free onsite design consultations and estimates to all of Orange County.